The objective of the present study was to implement a chairside diabetes screening strategy for the identification of undiagnosed hyperglycaemia in periodontal patients. 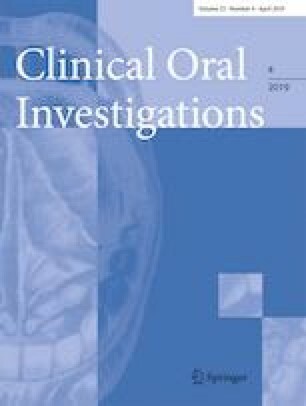 Measurement of HbA1c was performed in patients (n = 139) diagnosed with periodontal disease to determine possible unknown hyperglycaemia. Patients fulfilled the criteria for screening according to the questionnaire by the Centers for Disease Control and Prevention (CDC). The Cobas® b101 in vitro diagnostic system was used for the measurement of glycosylated haemoglobin (HbA1c) in capillary blood. Body mass index (BMI) and waist circumference were also measured to determine splanchnic obesity. Periodontal parameters were assessed with an automated probe and included probing depth, clinical attachment loss, bleeding on probing and presence/absence of plaque. Most patients had moderate periodontitis. Almost 25% of the subjects tested were found to have unknown hyperglycaemia while 80.5% of them had splanchnic obesity. A significant association was found between HbA1c and BMI (Mann–Whitney test; p = 0.0021) as well as between HbA1c and waist circumference (Spearman rho test; p = 0.0007). No differences were observed regarding periodontal parameters between subjects exhibiting HbA1c ≥ 5.7% and those with HbA1c < 5.7% (Mann–Whitney test; p > 0.05) although those with HbA1c ≥ 5.7% displayed higher proportions of sites with clinical attachment loss > 5 mm (z test with Bonferroni corrections; p < 0.05). Periodontal patients, especially those with a bigger than normal BMI and waist circumference, are a target group worth screening for diabetes. The dental practitioner can contribute significantly to the worldwide effort of health care professionals in diabetes screening and referring for early diagnosis of the disease. The authors would like to thank Pierre-Fabre Hellas for financially contributing to the study. The study was partially funded by Pierre-Fabre Hellas. This article does not contain any studies with human participants or animals performed by any of the authors. All applicable international, national, and/or institutional guidelines for the care and use of animals were followed. All procedures performed in studies involving human participants were in accordance with the ethical standards of the institutional and/or national research committee and with the 1964 Helsinki declaration and its later amendments or comparable ethical standards.